What better place to chill out than an abandoned airfield? With spies, intrigue, double agents, the CIA, KGB, the space race and not to mention the nuclear arms race it is no wonder that the Cold War continues to fascinate. Playing up the action were the countless films made during the period, from James Bond to classics like “The Spy who came in from the Cold” and many of the real life stories from the period are every bit as exciting as the movies. Berlin was at the front line of the Cold War and bore the brunt of much of the Superpower's political machinations. During the first Cold War crisis, the Soviets blockaded West Berlin forcing the allies to embark on the largest airlift in history, landing over 200,000 planes during the 300 day blockade, providing 4700 tonnes of necessities daily! 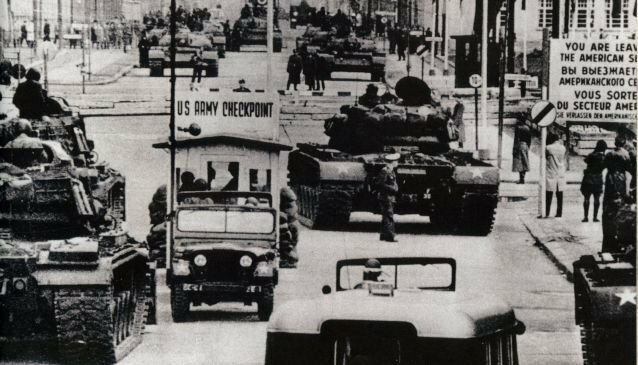 On the 27th of October, 10 Soviet and 10 American tanks faced off for over 16 hours across the border at Checkpoint Charlie – thankfully the crises ended peacefully but it could have easily triggered World War 3. There are many locations across Berlin that still bear the legacy of the Cold War from grand Monuments, to impressive examples of communist architecture. The distinctive identity of the various Berlin localities also have a great deal to do with the Cold War and the 55 year division of the city including of course the period from 1961 to 1989 that the Berlin Wall snaked its way through the German capital. Here are 10 of our favourite original Cold War sites that stand the test of time - Be sure to check out our video below on the Top 5 Cold War Sites with Mike from Insider Tour. What better place to chill out than an abandoned airfield? No, really, believe me, it totally works! 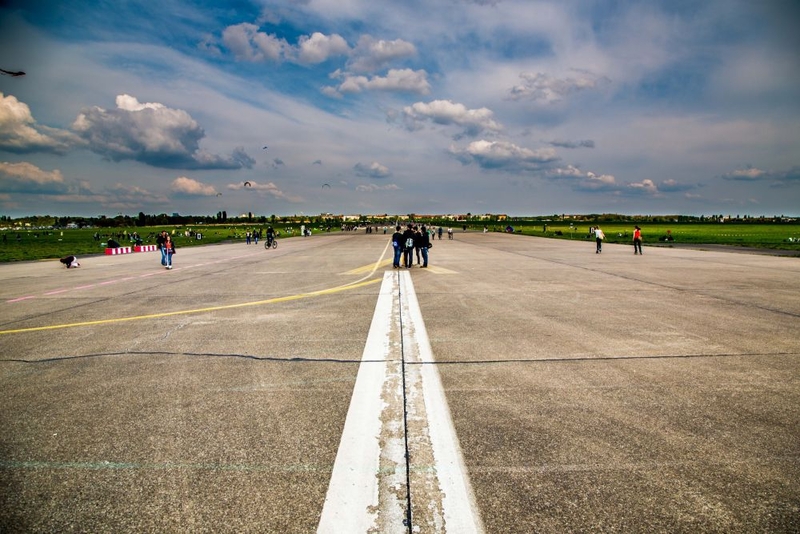 Berlin Tempelhof Airport closed operations in 2008 and has now become one of Berlin’s largest and most visited public parks. Built by the Nazi's in 1927, through the Cold War years it was the main airport for American Military Transport into West Berlin and was used extensively during the Berlin Airlift. In 2010 the space was re-opened as a city park and now, thousands of people flock to the airstrip on a sunny day to picnic, ride bikes or rollerblade, fly kites or generally romp around in the huge open space. It’s not only the outdoor areas that are in use nowadays, the massive airline hanger now hosts all sorts of events throughout the year. Fairs, fashion shows and music concerts are held here, giving another tick in the city’s list of cool places to experience in Berlin. There is also a company offering fascinating english language tours of the buildings every weekend. This Stasi Museum is housed in the former Stasi headquarters of Berlin where the MFS (Ministry for State Security) ran operations for nearly 40 years. After the fall off the Berlin Wall the new government established this whole compound as a research centre, open to the public in 1990, but it wasn’t until 2012 that ‘House 1’ of the offices was opened as an exhibition. Here you can see the offices complete with original furniture, of Erich Mielke, who was head of the Stasi for 30 years. You can also learn about ‘Tradition Work’ in the Stasi, the resistance and opposition it faced and see all sorts of artefacts on display like spy cameras and other tricks of the trade that they used to gather information. The Stasi museum is open every day of the week and is very affordable at only €5 for entry. This building, next to the Friedrichstraße train station in Berlin Mitte, was one of the border crossings during the Cold War, where people could travel from East to West, provided they had the correct documentation and were admitted by the border control guards. Translated, the Tränenpalast means The Palace of Tears, a fittingly emotional title for a place where loved ones said their goodbyes, not knowing when they would see them again. Now a free museum, here you can learn more about the history of the border, and discover people’s stories who had first hand experience with this building, who said their own goodbyes right on this spot. If you want to get back to basics, you need to visit the wonderful Gedenkstätte Berliner Mauer. On this site stands part of the original wall and a preserved section of the death strip with lookout guard tower. You get a great view of this from the observation deck across the road. From here you have a view from the Chapel of Remembrance all the way to Nordbahnhof train station, which also has a ‘ghost stations’ exhibition within it. If you walk the length of Bernauerstraße you’ll see original photos, learn about escape attempts and the people who lost their lives, see where the underground tunnels ran and the original floor plan of the church. There is a visitor’s centre opposite the station where you can get more information on the Berlin Wall. This memorial is a must see when you are in Berlin. Opened four years after the end of World War 2, the Soviet War Memorial in Treptower Park is the burial ground for up to 5000 Soviet soldiers who fell in the Battle of Berlin in April-May 1945. This memorial is massive and breathtaking with impressive statues, sarcophagi and sculptures. Interestingly, and somewhat fittingly, the red granite used in the large stylised Soviet flags beside the kneeling soldiers, which was taken from Hiltler’s New Reich Chancellery after the war. Renovated in 2004, this memorial sits in Treptower Park which also has lots of green space for picnicking and lounging in the sun. 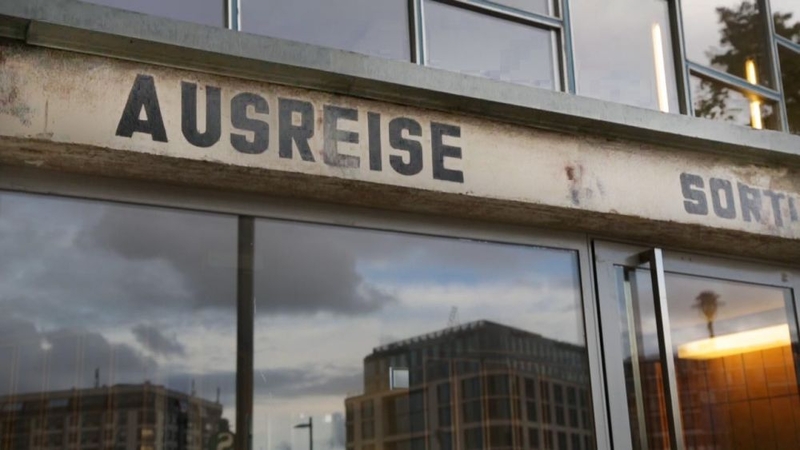 This museum in the Kulturbrauerei in Prenzlauer Berg is the perfect place to get an inside look at what life was like behind the Berlin Wall. It’s filled with memorabilia and artefacts from the era, an original Trabi car with attached camping hood, scenes from work and play and heaps of information on the times. One of he best parts is the footage. You can watch original interviews with the general public living in East Berlin and get a small glimpse on how they felt about it and the restrictions it placed on them and their lives. This free museum should take about 2 hours to get through, depending on your interest and is well located to combine with a trip to the Berlin Wall Memorial. This prison has definitely seen some political history. If you were a political prisoner or opposed the GDR regime you would have likely seen the inside of these cells. In 1945 the Stasi police took over this old canteen block and used it as a detainment camp. In 1946 the cellar part was converted into an area for interrogation and detention before it closed, and after reopening in 1951 by the East German ministry of State Security, it was used as a remand centre until 1989. A tour of this prison, in English, only happens once a day at 2.30pm for €5. You’ll discover all about the world of the Stasi and their intelligence gathering techniques, surveillance and interrogation techniques and more. These tours are often run by former inmates, yet another reason to go and get a story – first hand. What better way to delve further into the Cold War than to learn about Stasi methods and surveillance, who the key figures were and most intriguingly, where are these people now? On Insider Tour’s Cold War Berlin tour, they will take you on a specific city walk, which opens up the secrets of GDR Berlin: the ghost trail of the death strip and the Berlin Wall, the escape attempts, the spies and the soviet secrets. It takes four hours in total and only costs €12 or €10 if you are under 26! Tours leave every Tuesday, Thursday and Saturday all year round, no booking necessary just turn up at the meeting point in Hackescher Markt and you’ll be on your way. With Berlin on Bike’s tour of the Berlin Wall, you can cover far more ground than you would trying to see this much of the wall on foot. Starting at the Kulturbrauerei in Prenzlauer Berg you will ride 15 kilometres between Bornholmer Straße and the government district. During your ride you’ll discover border checkpoints, original death strip sections and what remains of the Berlin Wall today. All this unveiled by a fantastic guide who knows everything one could know about the times of the Wall and it’s downfall. It’s a good idea to reserve a spot on his tour. The trip itself costs €14, you are welcome to ride your own bike or you can hire one from Berlin on Bike for an extra €5. Lasting around 3.5 hours, english tours run at 11.00am every Tuesday, Thursday and Saturday. 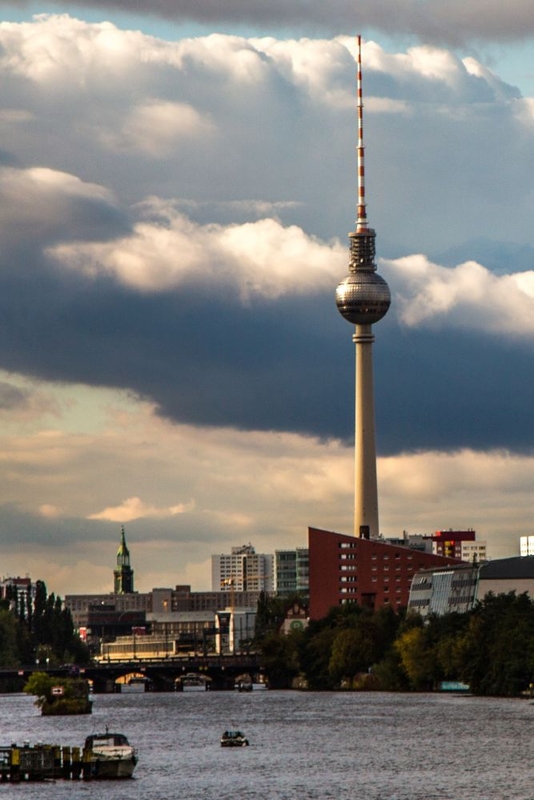 This being the tallest structure in Germany, the Fernsehturm (TV Tower) is a hard one to miss. Grandly rising out of Alexanderplatz, it was built between 1965 and 1969 by the German Democratic Republic administration and was a symbol of socialist technology and prowess in a divided city. Today it is one of Berlin’s most recognised sights and attracts over one million visitors every year. It’s a great place for the best view of the city from the observation platform or even as you enjoy a coffee or a meal in the revolving restaurant situated within the circumference of the sphere. Nervous about the May Day celebrations and protests in Berlin? Don't be, here's how and where to enjoy yourself. Spring in Berlin! The blossoms have bloomed and its time to get outside. What outdoor activities can you enjoy? Check out our list! Some of the best museums in Berlin are actually free! And those that aren't free, have some selected free days. Get to know them all. Want to find the very best coffee in Berlin? Head to one of the city's best coffee roasters to find it. The latest Berlin Wall exhibition in Berlin opened in 2018. Want to visit Nineties Berlin? My Guide Berlin tells you all about it. Need inspiration for things to do on Valentines Day in Berlin? Check it out! Want to go somewhere a little different for a drink? Check out our list of Berlin's best quirky bars.